View sample pages from the book here. Imaging has become a vital tool for researchers in all aspects of biology. Recent advances in microscope technology, labeling techniques and gene and protein manipulation methods have led to breakthroughs in our understanding of biological processes. In order to take advantage of these techniques, biologists need to understand the fundamental techniques of microscopy. The methods found here, drawn from the popular laboratory standard manual Cells: A Laboratory Manual, provide a solid course in the basics of using the microscope in a biology laboratory. 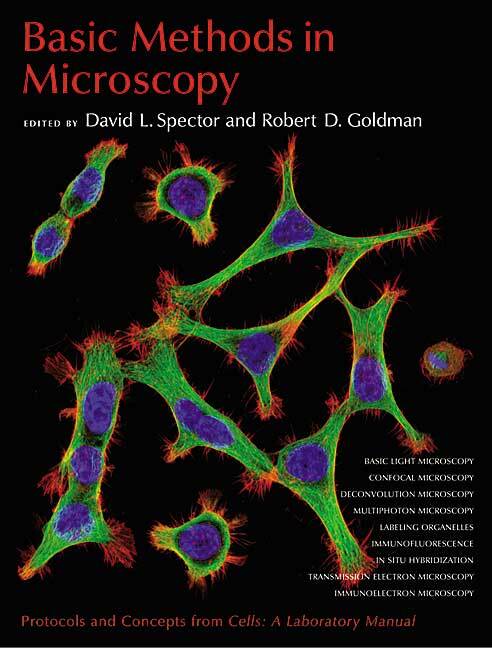 Basic Methods in Microscopy provides an essential guide to light microscopy, fluorescence microscopy, confocal microscopy, multiphoton microscopy and electron microscopy, preparation of tissues and cells, labeling of specimens and analysis of cellular events. This manual is an important tool for any biology researcher employing imaging as a research method.